Dolly Mae’s bold new book offers a way to move through life’s crossroads gracefully. Change will always happen. It’s how we meet that experience that determines who we really are. This book shows how to find joy and remain happy when life seems to bring more than we can endure. No matter what we experience: heartache, illness, despair, grief, loss or financial struggle, Choosing Joy shows us how to regain our balance and be happy once again. If you have ever faced life’s hard questions, or are struggling with them now, then this book is for you! If you find your life is not all you want it to be, Choosing Joy in the Midst of Crisis holds the potential for helping you figure out where you may be going wrong. The entire book is built around a technique Dolly Mae learned from her teacher, Rajni. According to her, choosing joy is a matter of choosing love rather than fear. Beginning with the story of her own life and the loss of 25 million in assets, Dolly grabs the reader’s attention. Though she doesn’t give a lot of detail about how the situation arose, she does paint a clear picture of how it felt to dread the arrival of the mailman and the devastation of receiving a continuous flow of foreclosures. Faced with this, she reversed her attitude and became joyful. So strong was her belief in this way of living in joy that she refused to pursue an opportunity to recover her losses because it would have kept her captive in the situation. Critical to the understanding of her message is the chapter on the Law of Triadic Creations. With easy-to-understand illustrations and examples, Dolly teaches the reader how to put a situation into two different triangles, one of love and one of fear. Here is where one can see how the choice affects the situation. Each example is worked through the love triangle and the fear triangle. She outlines how one can be in a place of love and shift to fear because of old beliefs or patterns. The underlying message is that anyone can choose joy no matter how devastating his or her life may appear at the moment. A strong point Dolly Mae makes is that we are living in a fear-based culture that perpetuates victimhood and provides rescuers. The consequences of becoming victims in this system are illness, disempowerment, and denial that we are the creators of our lives. In addition, we make God responsible for making things okay. In this process, Dolly says, God becomes both rescuer and persecutor. Throughout the book are many thought-provoking statements backed by examples. Consider this, Dolly Mae says: the time may come when we no longer need our immune system. When we learn to love enough, we will no longer create the illnesses that kill the body. After each example, she goes into a brief explanation of her beliefs on the subject. The book covers a large array of circumstances, all from the perspective of her basic theme — choosing. For those who like practical information, there is a list of ten ways to choose joy. Though they are not new, they are good reminders of how we can pull ourselves out of the victim-rescuer-persecutor triangle. As a counselor, Dolly Mae has drawn on years of experience to give examples that support her principles. 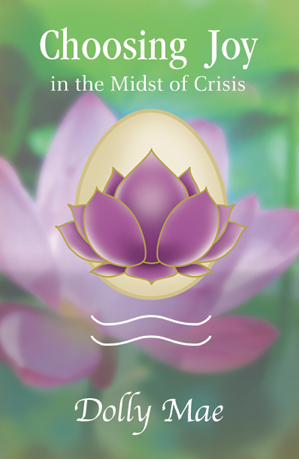 Choosing Joy in the Midst of Crisis is one of those books that can be read in short spurts or from cover to cover. It relates to the reality in which most people live and addresses common problems. Dolly’s straightforward approach leaves little room for excuses justifying a victim role. Definitely a self-help book for the person who wants to change, Dolly Mae’s Choosing Joy in the Midst of Crisis is a believable and inspiring guide to getting through situations by consciously choosing joy. In any moment you can choose Joy. It is always a choice! Copyrighted 2001- 2007. All rights reserved.